Piotr Faliszewski  (AGH University of Science and Technology, Krakow) is visiting our group as a winner of a Friedrich Wilhelm Bessel Research Award  of the Alexander von Humboldt foundation. Arnaud Casteigts  (Bordeaux University) is visiting our group. 18th International Conference on Autonomous Agents and Multiagent Systems , Montreal, Canada. Robert Bredereck  and Dušan Knop  are part of the program committee. 20th Conference on Integer Programming and Combinatorial Optimization , Michigan, USA. Dušan Knop will give a talk titled "Integer Programming and Incidence Treedepth". 11th International Conference on Algorithms and Complexity , Rome, Italy. Matthias Bentert  and Philipp Zschoche  will give a talk titled Parameterized Complexity of Diameter . Současné teoretické informatiky,  Prague, Czech Republic. Dušan Knop will give a talk titled "High-Multiplicity Fair Allocation: Lenstra empowered by N -fold Integer Programming". DIMEA (Laboratory of Discrete Methods and Algorithms) Days,  Brno, Czech Republic. Dušan Knop will participate. 45th International Workshop on Graph-Theoretic Concepts in Computer Science,  Vall de Núria, Spain. Rolf Niedermeier  is member of the program committee. International Joint Conference on Artificial Intelligence,  Macao, China. Robert Bredereck  and André Nichterlein  are members of the program committee. Application-Oriented Computational Social Choice , Schloss Dagstuhl, Germany. Rolf Niedermeier  is co-organizer and will attend. Middle-European Conference on Applied Theoretical Computer Science,  Koper, Slovenia. Rolf Niedermeier  is member of the program committee. 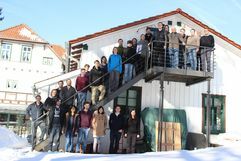 Algorihtms and Complexity in Phylogenetics,  Schloss Dagstuhl, Germany. Rolf Niedermeier  is co-organizer and will attend.